Sugar Lips Mini Donuts, (805) 864-3366, sugarlipsminis.com. SLODoCo, 793-F Foothill Blvd., SLO, (805) 782-9766, slodoco.com. When Sondra Williams co-founded Twisted & Glazed doughnut shop in downtown Paso Robles a year ago, "doughnut weddings" weren't on her radar at all. "It didn't really cross our minds," Williams told New Times. "I can't say before we opened our shop I'd ever been to a wedding that had doughnuts." CREATIVE DISPLAYS Twisted & Glazed doughnut shop in Paso Robles brings more to weddings than just doughnuts. It can also help design creative doughnut displays like shelves or wall hooks. But then the calls started flooding in: "Do you do weddings?" While surprised, Williams didn't hesitate to embrace a new opportunity. "I was just really excited," she said. "I'm always up for a challenge and something that really racks my mind in terms of creativity." DOUGHNUT ART More and more brides and grooms are choosing doughnuts for their weddings, and several shops in SLO County can custom design their sweet treats for the occasion. Weddings quickly became an integral part of Williams' new business. In its first year, Twisted & Glazed worked at least 20 weddings on the Central Coast, she said, serving up doughnuts of myriad flavors, colors, shapes, and sizes, and in themes ranging from "an old fashioned love story" to the Golden State Warriors. "We've done some really exciting projects," Williams said. "That's one of the draws of doughnuts: There's so much you can do with it and it's constantly changing and there are so many ideas." Twisted & Glazed isn't the only doughnut joint in SLO County in on the craze. Sugar Lips Mini Donuts and its mobile trailer—where doughnuts are made fresh on site—are parked at wedding receptions nearly every weekend. And SLO Donut Company (SloDoCo) in San Luis Obispo is churning out sweet treats for multiple weddings a week, according to business manager Brandon Miller. "It's so interesting: When I started at SloDoCo it was pretty rare we'd get a wedding order," Miller said. "But now, every weekend we have multiple, large wedding orders we're executing." Wedding doughnuts are a nationwide trend rocking the industry right now. A quick Google search of the term brings up a plethora of Pinterest links, listicles like, "20 Delicious Ways to Serve Donuts at Your Wedding," and stories on Brides.com like, "Doughnut Walls are the Next Big Wedding Trend Sweeping the Internet." 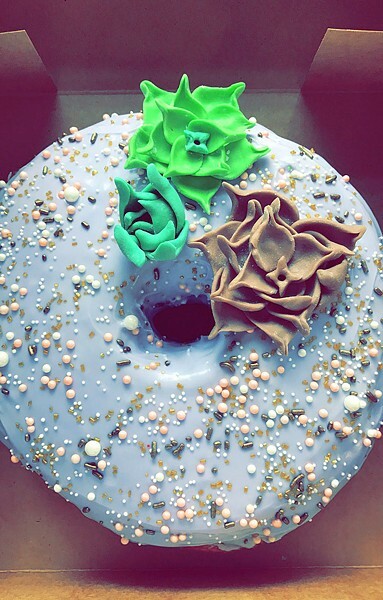 Local doughnut makers told New Times they're seeing couples looking for a wedding dessert that's easier on the wallet than a cake and has a "fun" vibe allowing for some silliness and creativity. FRESH FROM THE OVEN Sugar Lips Mini Donuts parks its trailer at wedding venues throughout the county to serve up freshly made doughnuts with a variety of toppings. "It's a great opportunity for people to do something that's a little trendy and sort of a spin off of tradition," Williams said. "Cakes are fantastic but they're very, very expensive. ... And we've eaten cake for so many years. I think it's just a shift in what people want to spend and what people want to offer." Williams recalls perhaps her most elaborate wedding order last year, for a Bachelor producer who got hitched on the Central Coast. 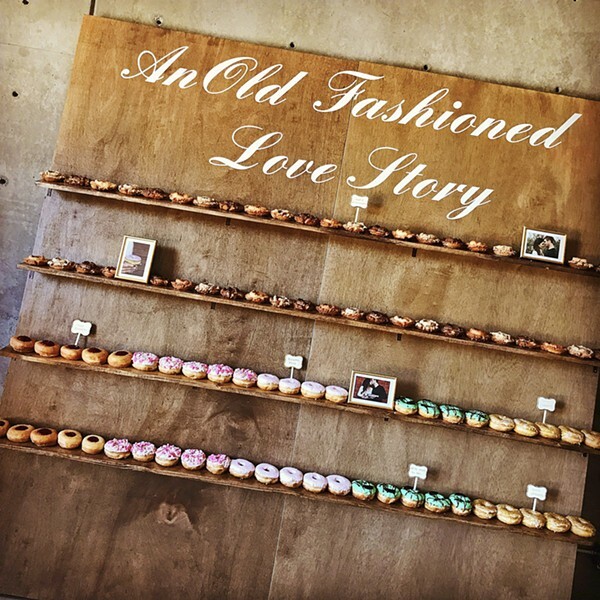 "We did a huge doughnut wall and it was 'an old fashioned love story' [theme]," she said. "It was massive—probably a 12-foot-wall that had shelving on it. Then we just put all these doughnuts on a gigantic wall." But each couple is different. Some want a simple serving of the traditional doughnuts and flavors. Others want something more unique and over-the-top. Many have no idea what they want and turn to Williams for guidance. A couple of Twisted & Glazed's specialties are doughnut hole "towers," which can be arranged in various eye-catching ways, and extra-long doughnuts—long enough to cut like a wedding cake. "The opportunities are endless," Williams said. "It's cool to be able to look at a table and just go with it. It's fun to be in that mindset." SloDoCo is similarly ready to create whatever doughnut dreams a bride and groom desire. They can make custom orders or roll out their bread-and-butter flavors. One of those SloDoCo trademarks is the "galaxy doughnut"—a rainbow doughnut with swirls of marshmallow frosting. "That's one of our most popular wedding doughnuts because it's really beautiful and it's got glitter dust on it," Miller said. "They can match their frosting colors with the wedding colors or bridesmaids' dress colors." 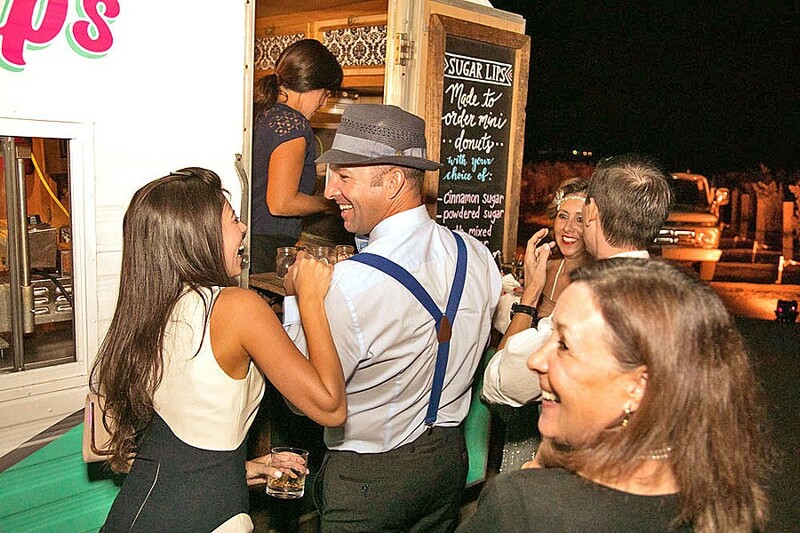 Twisted & Glazed can deliver all its goods to your wedding venue and help set it up. Right now, SloDoCo doesn't deliver, but Miller said the wedding demand has gotten so high now that they're exploring the possibility. "We did purchase a delivery van and are in the process of working that in," Miller said. MATCHING COLORS SLO Donut Company in San Luis Obispo serves multiple weddings a week now. 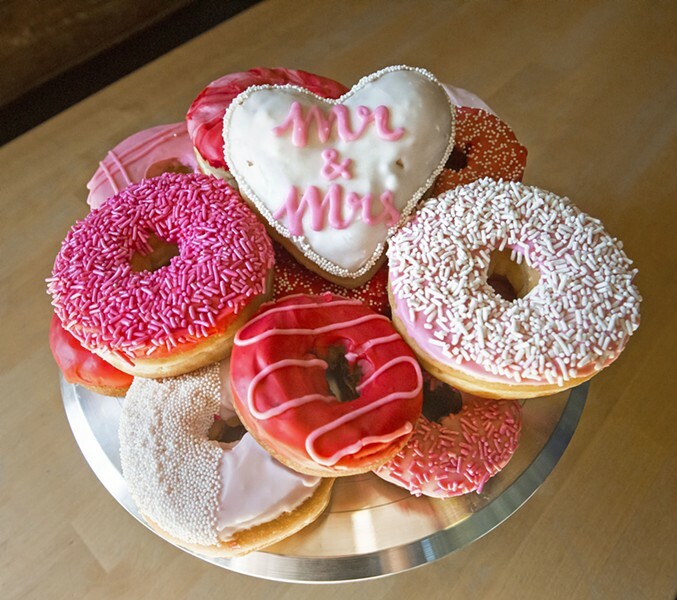 They can custom design doughnuts to a theme or to match the colors of bridesmaids' dresses. Sugar Lips Mini Donuts offers something a little different. Co-owner Jessica Brown said they park their vintage trailer at a wedding venue like a food truck. Wedding attendees can watch their doughnuts being made in the machine through the window and then add any topings or flavors that they want. "We usually come the last hour or two of the night," Brown explained. "It's usually alongside a wedding cake or cupcake or some other dessert. It's kind of fun because it gives people different choices." Brown has parked the trailer at the SLO Farmers' Market since 2007 and started working weddings in 2015. In terms of the doughnut wedding trend, she said people enjoy the novelty of it.